How can I create a split-scroll effect in an NES game? The status bars are clearly too big to be sprites, yet they don't scroll with the background. How did they do this? 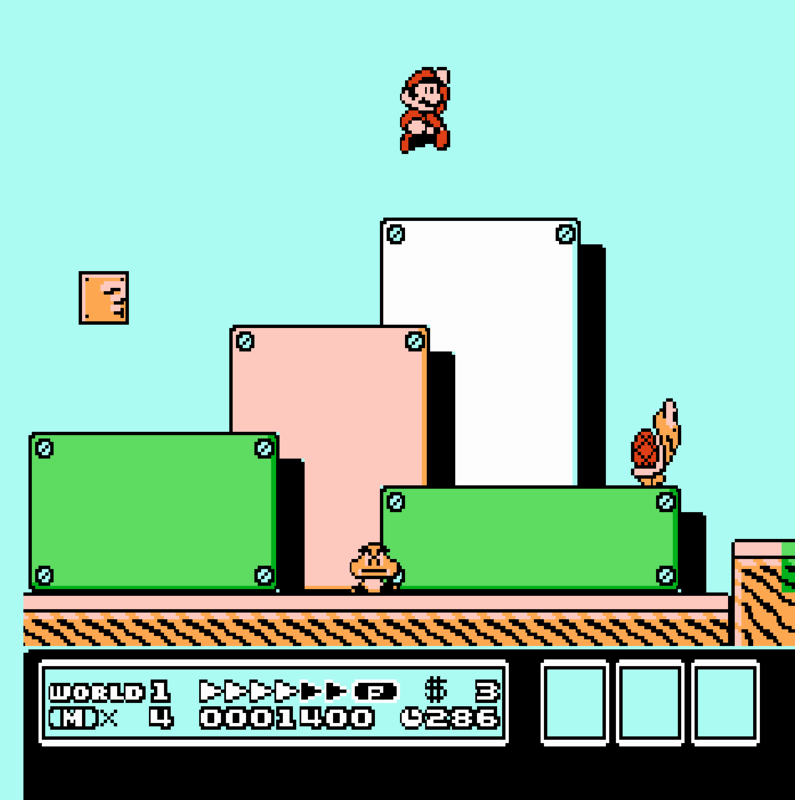 How can I do this in my own NES games? This is done by changing the scroll mid-screen. The horizontal scroll is 0 (you can barely see the white line on the left side). Now the horizontal scroll is at the left edge of the visible area. The PPU draws the screen in the same order you read text on a page -- left-to-right and top-to-bottom. Each horizontal line of the picture is called a scanline, and the picture is 240 scanlines tall. In between each frame is a short period of time called vertical blanking (or VBlank) where the PPU is idle. The PPU cannot be written to outside of VBlank because it is very busy and trying to talk to it will mess it up. The first write sets the X scroll, and the second write sets the Y scroll. In order to create a split scroll, set the scroll value for the top section of the picture during VBlank, wait until the PPU is drawing the last scanline of the top section, and then change set scroll for the bottom section. The PPU sets bit 6 of PPUSTATUS if an opaque pixel of the sprite at OAM index 0 intersects an opaque background pixel. It sets this flag as soon as it draws the intersecting pixel, so by putting sprite 0 at a clever location, a game can detect when the PPU has drawn a part of the picture. See that, above and slightly to the left of Mario's head? 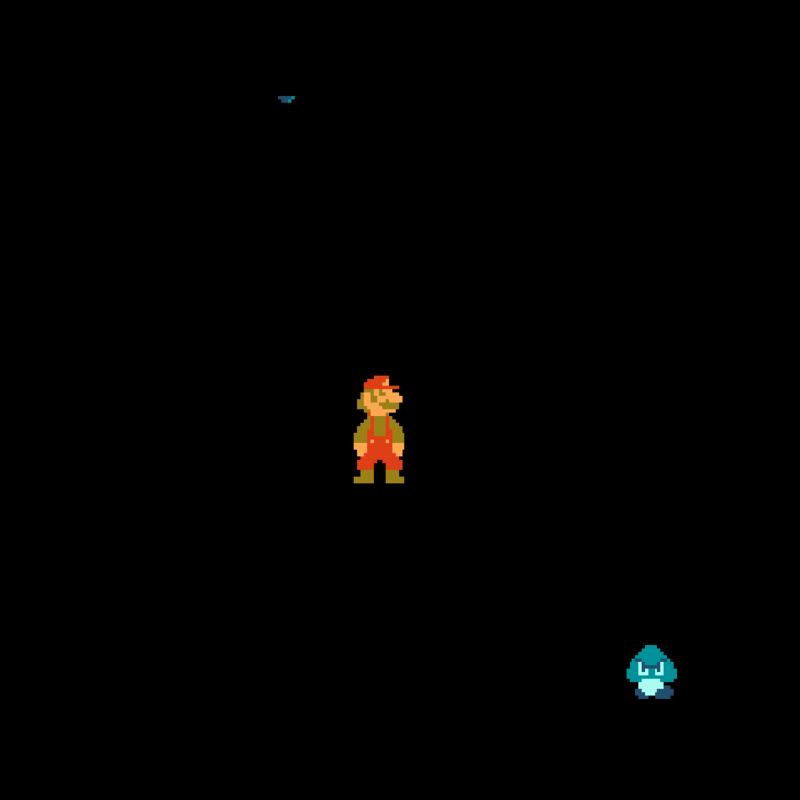 Sprite 0 Hit works well for a status bar on the top, but what about Super Mario Bros. 3, which has the status bar on the bottom? The game can't waste 80% of the frame waiting for the PPU to reach the status bar -- it needs to time to run the game logic! Some mappers, such as the MMC3, can generate an interrupt once the PPU reaches a certain scanline. This is the easiest way to tell when the PPU reaches a certain point of the screen, and it's also the most efficient because the CPU can do other things instead of polling the PPU. Here's how to set up a scanline IRQ with the MMC3. Other mappers are similar but not the same; check wiki.nesdev.com if you're using a different mapper. ;A is the number of scanlines from now you want the interrupt. ;you would like the interrupt at. sta $C000   ;Set the counter reload value. sta $C001   ;Trigger a reload at the end of this scanline. sta $E001   ;Enable the interrupt. Your IRQ handler will then run once the PPU draws the target scanline. Setting the horizontal scroll is easy -- just write to PPUSCROLL like normal. Setting the vertical scroll during rendering is far more difficult and requires knowledge of the implementation details of scrolling. The PPU contains four internal registers to store address/scroll-related data. These registers are modified by PPUSCROLL and PPUADDR (and the nametable select bits of PPUCTRL). These registers are usually referred to as v, t, x, and w.
v is a 15-bit register which stores the current VRAM address. t is the temporary VRAM address, also 15 bits. x is a 3-bit register which stores the fine X scroll, and w, a 1-bit register, stores whether this is the first or second write to PPUADDR or PPUSCROLL. A read from PPUSTATUS will reset w to 0. PPUADDR directly sets t and v, while PPUSCROLL only sets t. When writing a byte to PPUADDR, if w is 0 (the first write), the byte will be written to the upper 7 bits of t and w will be set to 1. If w is 1 (the second write), the byte will be written to the lower 8 bits of t, t will be copied to v, and w will be reset to 0.
where NN is the nametable select from PPUCTRL, YYYYY is the coarse Y scroll (the upper 5 bits), and XXXXX is the coarse X scroll. Because the upper 3 bits are constant, they're used to store the fine Y scroll. The fine X scroll is stored in x. The PPU stores in v the address/scroll of the tile currently being fetched, and t stores the address/scroll of the upper-left corner. When the PPU finishes fetching a tile, it increments v to move to the next tile, and at the end of each scanline, it increments the vertical scrolling bits and reloads the horizontal scrolling bits from t to jump to the beginning of the next scanline. It only loads the vertical bits from t at the top of the picture, which is why we can't easily modify vertical scroll in the middle of the picture. However, the second write to PPUADDR will fully copy t to v, even in the middle of a picture. Write nametable << 2 to PPUADDR. This will write to the top half of t (We don't need to write the Y scroll bits here because they will be overwritten by the next write). Write the Y scroll to PPUSCROLL. This will write to the vertical scroll bits of t.
Write the X scroll to PPUSCROLL. This will write the coarse X to the horizontal scroll bits of t and the fine X to x. Write ((y & 0xF8) << 2) | (x >> 3) to PPUADDR. This will write to the bottom half of t and copy t to v.
The last write should occur during horizontal blanking (but after the PPU increments the vertical position) to avoid the split happening mid-scanline and looking glitchy. Here is some code to perform a horizontal and vertical scroll split. If you're using sprite 0 hit, run this code after the hit is detected; if you're using a scanline IRQ, run this in your IRQ handler. ;Write nametable bits to t.
;Write y bits to t.
;HBlank is very short, so calculate the value to write now, before HBlank. ;Write the X bits to t and x.
;Finish calculating the fourth write. ;until you don't have a visual glitch. ;Write to t and copy t to v.
Not the answer you're looking for? Browse other questions tagged nes graphics software-development or ask your own question. What techniques were used to reduce the required re-rendering in 3D programs? How were 3D effects created before GPUs? Do TG16 games and software suffer from lag frame similar to NES Super Mario Bros? Are NES turbo buttons internal to the controller? 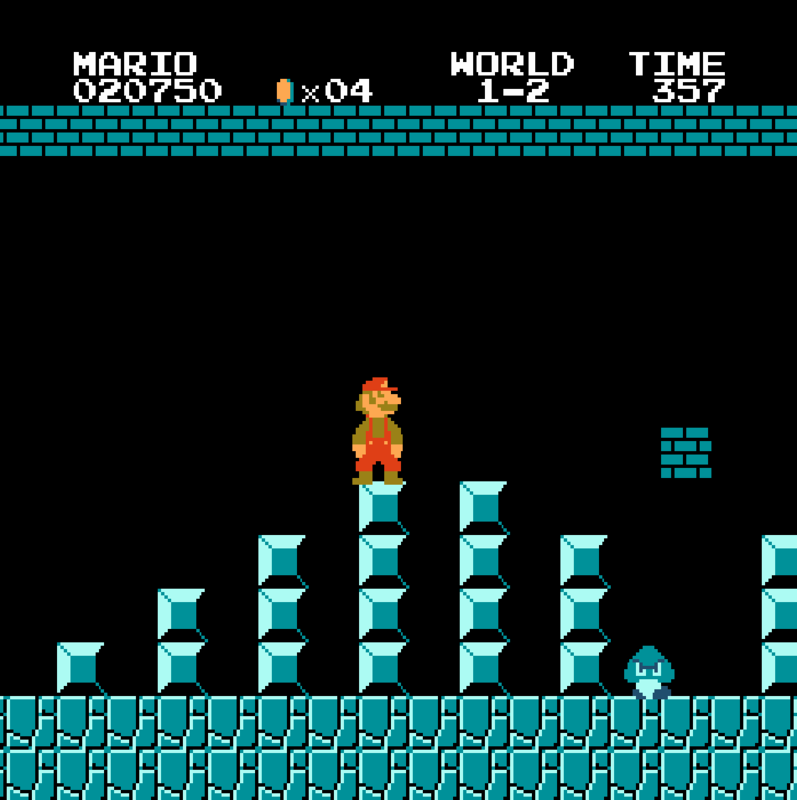 How did Super Mario Bros. 3 create this tunnel vision effect?